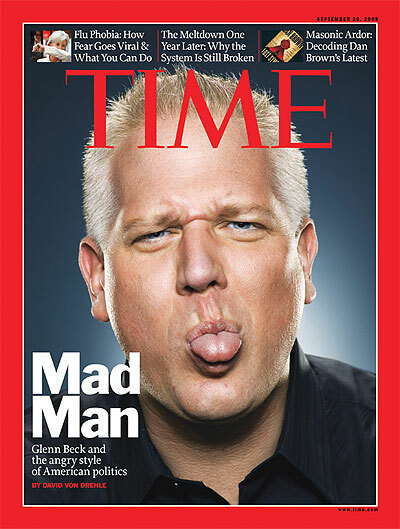 Glenn Beck is featured on the cover of the latest issue of TIME magazine. A leading voice in right-wing media, Beck is one of the hottest--not to mention most controversial--voices in conservative circles. Beck is 45, tireless, funny, self-deprecating, a recovering alcoholic, a convert to Mormonism, a libertarian and living with ADHD. He is a gifted storyteller with a knack for stitching seemingly unrelated data points into possible conspiracies — if he believed in conspiracies, which he doesn't, necessarily; he's just asking questions. He's just sayin'. In cheerful days of yore, he was a terrific host of a morning-zoo show on an FM Top 40 station. But these aren't cheerful times. For conservatives, these are times of economic uncertainty and political weakness, and Beck has emerged as a virtuoso on the strings of their discontent. Rush Limbaugh, with his supreme self-confidence, holding forth with "half my brain tied behind my back just to make it fair," found his place as the triumphant champion of the Age of Reagan. Macho Sean Hannity captured the cocky vibe of the early Bush years, dunking the feckless liberal Alan Colmes for nightly swirlies on the Fox News Channel. Both men remain media dynamos, but it is Beck — nervous, beset, desperate — who now channels the mood of many on the right. "I'm afraid," he has said more than once in recent months. "You should be afraid too." His fears are many — which is lucky for him, because Beck is responsible for filling multiple hours each day on radio and TV and webcast, plus hundreds of pages each year in his books, his online magazine and his newsletter. What's this rich and talented man afraid of? He is afraid of one-world government, which will turn once proud America into another France. He is afraid that Obama "has a deep-seated hatred for white people" — which doesn't mean, he hastens to add, that he actually thinks "Obama doesn't like white people." He is afraid that both Democrats and Republicans in Washington are deeply corrupt and that their corruption is spreading like a plague. He used to be afraid that hypocritical Republicans in the Bush Administration were killing capitalism and gutting liberty, but now he is afraid that all-too-sincere leftists in the Obama Administration are plotting the same. On a slow news day, Beck fears that the Rockefeller family installed communist and fascist symbols in the public artwork of Rockefeller Center. One of his Fox News Channel colleagues, Shepard Smith, has jokingly called Beck's studio the "fear chamber." Beck countered that he preferred "doom room." On the recent anniversary of the 9/11 attacks, Beck grew afraid that Americans may no longer be the sort of people who cross mountain ranges in covered wagons and toss hot rivets around in bold bursts of skyscraper-building. Tears came to his eyes (they often do) as he voiced this last fear. But then he remembered that the fiber of ordinary Americans is the one thing Glenn Beck need never fear. So he squared his quivering chin to the camera and held up a snapshot of ground zero, still empty eight long years after the World Trade Center was destroyed. And he said, "Let me tell you something. I believe that if it were up to you or me, just regular schmoes in America, the Freedom Tower would have been done years ago. And it wouldn't have been the Freedom Tower; it would have been the Freedom Towers — because we would've built both of these towers back the way they were before! Except we would've built them stronger! We would've built them in a way that they would've resisted attack. And you know what? My guess is they would've been 25 stories taller, with a big, fat 'Come and Try That Again' sign on top. We would've built it with our bare hands if we had to, because that's what Americans do. When we fail, when we face a crisis, we pull ourselves up and make things better. I believe the only reason we haven't built it isn't because of Americans. It's because we're being held back. And who is holding us back? Politicians. Special-interest groups. Political correctness. You name it — everybody but you." 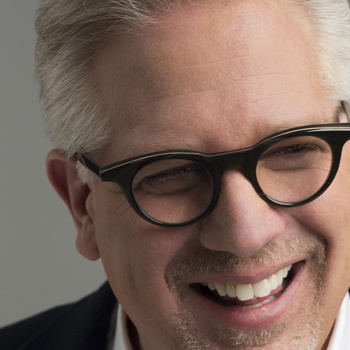 Glenn Beck is booked for speaking engagements exclusively through Premiere Speakers. For information on how to bring him to your next event, visit www.premierespeakers.com/glenn_beck.